Feeling pretty down today. I'm trying really hard to remain grateful and positive because I really do believe that these things bring good into your life. And I lead such a charmed life it seems wrong to be unhappy. But yesterday a young woman was gunned down the the IDF. These things happen on an almost daily occurrence but since I've returned from my trip to Palestine it's much more personal. It's one thing to know what happens but it's another to experience it personally. When I was in Palestine I was denied entry to Jerusalem for absolutely no reason. This young woman was shot for asking for a female officer when she was asked to remove her Hijab. She was left without any medical attention for nearly 30 minutes while she bled out. And when she was finally taken way she was dragged like a rag doll. My husband had a cousin who was killed the same way. He too was only 17. At a non violent protest he was accused of throwing Molotov cocktails. Photos and videos proved he was doing nothing but he also was shot and left to bleed for 30 minutes before anyone was allowed to attend to him. What bothers me the most about these attacks is how quickly the world accepts that these killings are justified. 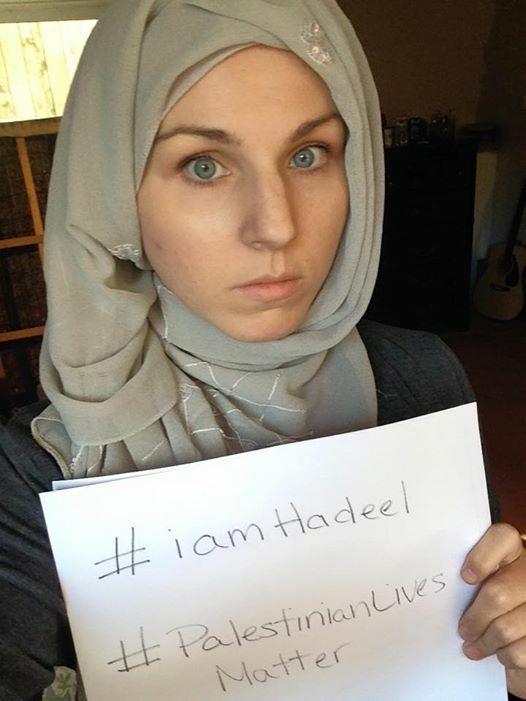 Right now all the mainstream media outlets are reporting that Hadeel tried to stab the soldiers even though photos and videos have proved these claims to be false. What ever happened to journalists doing their research and telling the truth? I don't understand how the world can be silent when children are being killed by the occupation every day. It might not be you today but who knows what tomorrow brings? The tactics that are being used by the IDF against Palestinians are being taught to police officers in America right now. It might not be you today but it could be any of us tomorrow. Thank you to Mindful Intifada for allowing us to share this.